1. You wish the timber to 'silver' with age to produce a natural weathered look? Use Cutek Wood Preservative 'Clear' oil for a water repellent coating, and the characteristic of retaining the timbers' dimensional stability and resistance to fungus and mould. 2. You wish to delay the 'silvering' process and maintain and enhance the natural colour of freshly oiled timber? Use Cutek Wood Preservative with a colour toner. Either match the colour of the timber for a natural look or choose a colour with which to stain the timber. 3. You wish to 'silver' the timber from new to make it appear weathered? Select Smokey Grey or Grey Mist. In addition to the above, they have been formulated to allow the timber to silver naturally over time as if it would do if it was 'clear'. Note: Colour toners are formulated to enhance the grain and natural beauty of the wood. Being transparent the colour of the substrate does affect the end result. 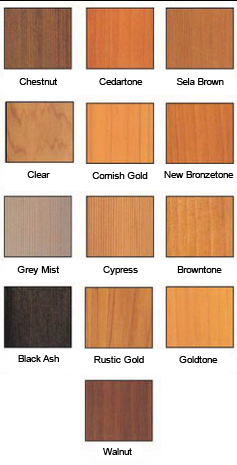 Samples shown here are on Western Red Cedar. It takes two coats for full colour definition. Confused? Give us a ring, we would be happy to assist!